Eucharistic Adoration is a devotion known mostly in the Catholic Church where the consecrated host, called the Blessed Sacrament, is exposed and viewable for adoration by the faithful. We believe that the Blessed Sacrament is truly the body, blood, soul and divinity of Our Lord Jesus Christ, and so we come to pray to and adore Him. When the Blessed Sacrament is exposed 24 hours a day, it is called Perpetual Eucharistic Adoration. 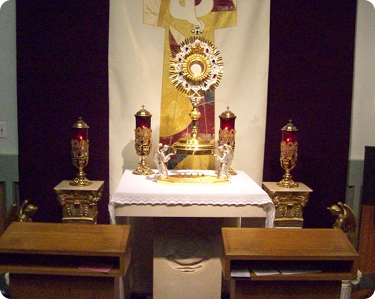 Through the ages, this beloved devotion has been practiced by monks and nuns in their cloistered environment, but in recent times it has become common for the lay faithful to establish chapels in their parishes specifically for the purpose of worshipping and adoring the Real Presence of Our Lord in the Blessed Sacrament. Who is using Adoration Manager? Adoration Manager started in Washington, Indiana in 2006 and has slowly spread to other chapels in Indiana as well as Florida, Alaska and even New Zealand! Contact us for a list of references. Our clients would love to talk to you about how their parish started eucharistic adoration! In the fall of 2005, Fr. Gordon Mann, pastor of the Catholic Community of Washington and Our Lady of Hope Church, in Washington, IN, established the Perpetual Eucharistic Adoration Chapel Committee. Realizing their need for guidance on how to run their program, the committee eventually contacted the Real Presence Assocation. Although the Real Presence Association provides a DOS-based software program for adoration, the committee needed much more functionality than this program was able to provide. Development of Adoration Manager was started in the winter of 2006 by Todd Hammer, founder of what would become Adoration Manager, LLC, under the direction of a small group of dedicated parishioners from the Catholic Community of Washington. After years of development and testing, Adoration Manager has proven to be an indispensible component of their adoration program. Todd is not only the engineer and developer of Adoration Manager, he is also an adorer at the Immaculate Heart of Mary Perpetual Eucharistic Adoration Chapel in Washington, IN.